Universal Lab. Power Supply, Part 1  "5V/3A, 50V/5A"
Universal Lab. 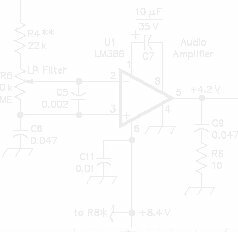 Power Supply, Part 2  "5V/3A, 50V/5A"
Circuits Archive - Older circuits. Most are working, some are not. Could be still useful. Tony's Data Sheets - Data Sheet for common Semiconductors. Radio Shack Partnumbers - Most common order numbers for my circuits. Resistor Value Calculator - By Danny Goodman, AE9F. TUP/TUN/DUS/DUG European transistor replacement system. PN100/200 - Data Sheets for the PN100 and PN200. LF13741 - Monolitic JFET Input OpAmp Data Sheet. MC14069UB - CMOS Hex Inverter Data Sheet. Cambridge Amateur Radio Club - CARC Homepage.